That's what I've been saying to myself over the past few days regarding my photography. I shot this image on a bike trail in the Valley Forge "corridor" in Pa. I was looking specifically for icicles hanging off of "cliff rocks"
Whenever I drive in to work during these frigid temps, I often see these beautiful ice formations on the rocks. opted to try to find them along the bike trail. This image here was about the only thing that came close to what I see on a much larger scale on the cliffs by the road. When I downloaded this from my camera, I noticed that I caught a piece of an icicle as it broke off in "mid air". It was the "tip" that had broken off. 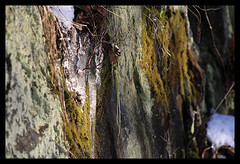 If you view this image in it's Original Size (by clicking on the image), you will see what I'm talking about ...towards the bottom of the image where the other icicle is hanging.